I need to make two embroidered squares for a baby girl quilt that we are making as a guild project. I was thinking of embellishing up some “Sunbonnet Sue” patters – adding a flower garden, butterflies, etc. But then I thought I’d rather go with a Kate Greenaway style girl, so I started searching online and came across a pretty neat site with plenty of inspiring content on it. 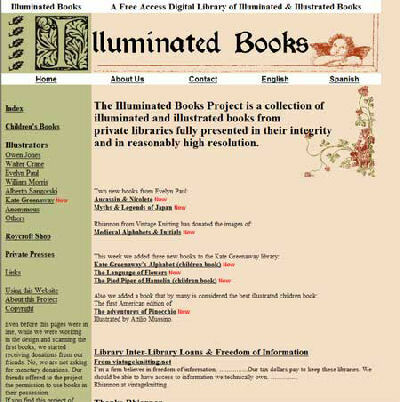 The site, Illuminated Books, hosts a digital library of many illustrated books, among them several Kate Greenaway books. In addition to Kate Greenaway, you’ll find some William Morris and even the Grammar of Ornament by Owen Jones, as well as some of his other works. The Grammar of Ornament is especially excellent – instead of a scanned version with slightly “off” colors, this is a photographed version. It’s great fun to flip through! My plan is to find a Kate Greenaway style gal and turn her into a line drawing, placing her in a little garden, with, perhaps, a beehive and some bees. So I’ll keep flipping through Illuminated Books to see if I can come up with any specific inspiration for just the right girl! As for the second quilt square, I haven’t decided – there’s no real theme to the quilt, so I have plenty of options! December 7, 2007 Awesome Embroidery Design Resource! I could spend HOURS in the Greenaway books alone! What beautiful illustrations. Thx for finding it. Previous Previous post: Hand Embroidery Project Completed! Next Next post: Crucifixion Chasuble: Historical Needlework Sample – Gorgeous!